Alumnus Michael Gallagher and his wife, Elizabeth, have made a $5 million gift to establish the Elizabeth and Michael Gallagher Family Professorships in Adult Stem Cell Research at the University of Notre Dame. Their gift, which will fund three new endowed professorships in adult and all forms of non-embryonic stem cell research, will strengthen Notre Dame’s leadership in the field of stem cell research and enhance the University’s effective dialogue between the biomedical research community and the Catholic Church on matters related to the use and application of stem cells and regenerative medicine. "As a Catholic university, Notre Dame carries a mantle of responsibility to use our scholarship and resources to help alleviate human suffering, and, in this area of research in particular, to do so with deep respect for the sanctity of all human life,” said Rev. John I. Jenkins, C.S.C., the University’s president. “These new professorships will enable us to effectively build upon an already strong foundation in this critically important field. We are tremendously grateful to the Gallaghers for making this possible with their transformative gift." Despite years of research, there are no known cures for a large number of degenerative diseases, such as Type 1 diabetes, Parkinson's disease, cardiovascular disease, macular degeneration and spinal cord injuries. Stem cell research has the potential to contribute to the discovery of new and successful treatments for these and other diseases because it holds the unique promise of regenerating damaged cells and tissues, fully restoring tissues and organs to their normal function. Although this vital area of research could accelerate the ability to alleviate much human suffering, it has generated extensive ethical debate with the use of embryonic versus non-embryonic stem cells. The Catholic Church affirms the dignity of all human life at every stage and vigorously opposes the destruction of human embryos for the harvesting of stem cells. At the same time, the Church strongly endorses the use of adult and non-embryonic stem cell research as a potential therapy for individuals suffering from these debilitating diseases. Research has demonstrated that adult stem cells, including all forms of non-embryonic stem cells, such as induced pluripotent stem cells and umbilical cord stem cells, can be harvested and programmed to achieve pluripotency — the same characteristic that enables embryonic stem cells to differentiate into any type of cell. An urgent need exists to increase the number of faculty experts performing adult stem cell research at Notre Dame. Doing so will expand upon the strong foundation the College of Science holds in these areas and will help create an environment for excellence in which faculty and students can learn, grow, collaborate and ultimately affect human health. "We are overwhelmed with gratitude at the generous gift from Mike and Liz Gallagher," said Gregory P. Crawford, dean of the College of Science. "The impact of this gift is truly beyond measure. It will play a crucial role in attracting three more of the best faculty in the field of adult stem cell research to Notre Dame. Furthermore, this gift will equip our existing talented group of adult stem cell researchers at Notre Dame to take the next great leap toward ultimately forming a premier center in adult stem cell research." Michael Gallagher is a 1991 graduate of Notre Dame, and his wife, Elizabeth, is a 1992 graduate of Saint Mary's College. They have two sons, Brock and Jack, and currently live near Denver. "As members of the Notre Dame family, Liz and I are excited to be able to support the wonderful work that is under way in the College of Science" Gallagher said. "We are confident that under Dean Crawford's leadership, adult stem cell research at Notre Dame will accelerate the discovery of new and successful treatments for individuals and their families impacted by disease." 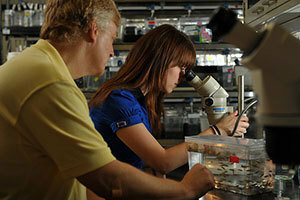 The Gallaghers' gift will build on the already strong adult stem cell research in the College of Science to help the University become a national leader in a vital research area by contributing groundbreaking discoveries aimed at unlocking the mystery of many of these diseases, and by serving as the setting for thoughtful discussion and transformative education on an important ethical issue. Originally published by Marissa Gebhard at newsinfo.nd.edu on June 22, 2012.